Some months ago, I was experimenting with pickling eggs. 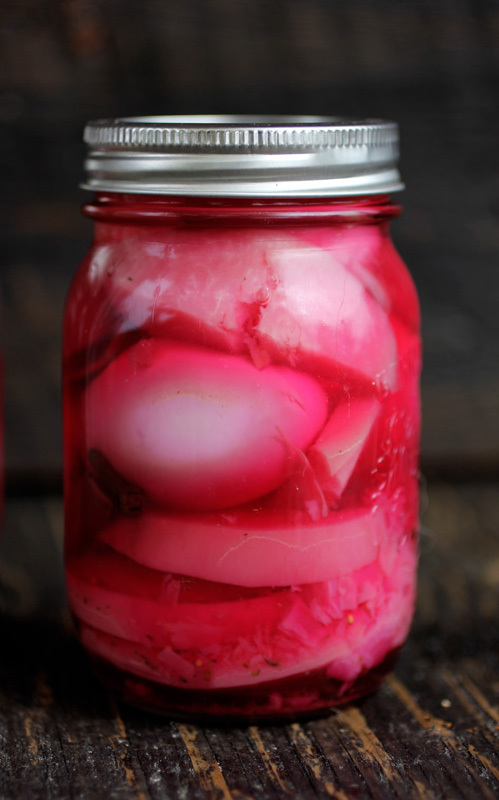 While searching through my fridge today, I found a jar of beet pickled eggs I'd made in the fall. The first two pictures of this post were taken within the first couple of weeks of their pickling, and, as you can see, the whites turned quite pink, while the yokes stayed yellow—lovely. 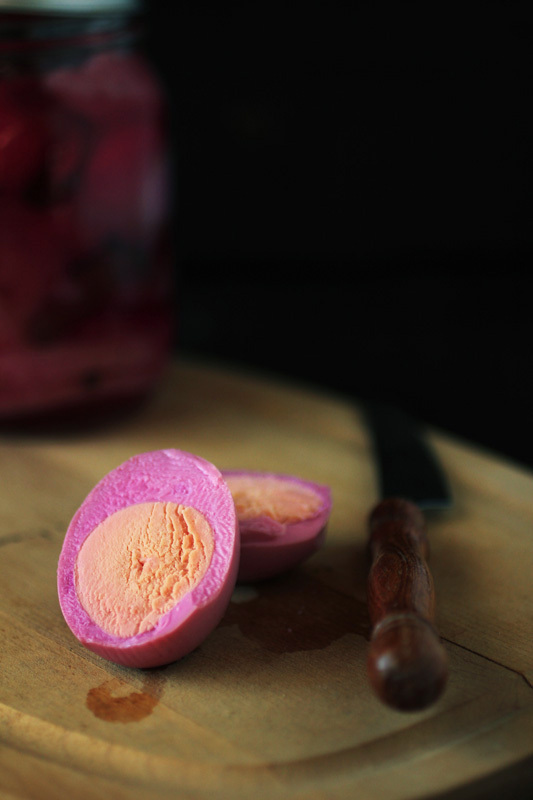 To make these eggs, I combined an adapted version of Putting It Up With Honey's Pickled Eggs with these Beet Pickled Eggs. Essentially, I followed the beet preparing instructions & egg/beet amounts from the Beet Pickled Eggs recipe, and then used the pickling instructions and brine from my pickled eggs. It filled two 500 ml jars. Five months later, you can see the pink started to leak through to the yokes. My original post on pickled eggs made reference to a recommended shelf life of a month for pickled eggs, when stored in the refrigerator. So, after so many months, I was worried about the quality of the egg...but then I ate it and it was great. It's been a couple hours since, and, aside from my cold, I feel fine. In conclusion, pickled eggs stay delicious much longer than a month in the fridge. These are really cute!! Did they taste like pickled beets? 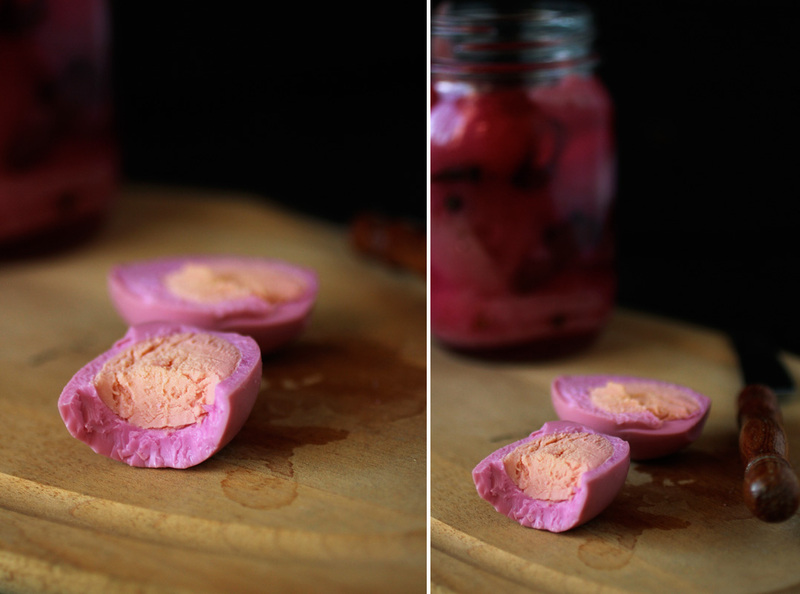 Oh yes, they taste pretty much the same as regular pickled eggs. You can't even taste the beets on the eggs. These are gorgeous! I'm going to get on making some for Easter. Wow these look amazing! I'm a huge beet fan and I'm also looking for new ways to use them. I can't wait to try. YUMMO!!!!! We have pickled eggs in the Philippines!!!! I used to eat them but they don't have it here in Australia. I must make some.